In 1891 construction of a three story manufacturing facility on Water Street began with great hopes of attracting a major shoe manufacturer to it. Several of Holliston’s old guard in the shoemaking industry had retired, died, or moved factories to more economical environs – leaving a large pool of skilled shoe workers in need of steady employment. In the completed building on Water Street: first floor used for sole leather cutting, second floor for bottoming rooms and offices; third floor for finishing and shipping; fourth floor cutting and stitching departments. No pillars or posts would obstruct any of the floor space. Each worker would have a window in front of him, as an effort to provide an improved working atmosphere. The total cost to be paid by the shareholders was $22,000. The grand opening of the new factory was heralded by a well-attended party November 1891. Over 150 couples danced on the makeshift third floor ballroom to music provided by Allen’s Orchestra of Natick and the Holliston Brass Band, and O.L. Cutting catered the affair. Hopes ran high that good fortune in the form of a shoe manufacturer would soon arrive at Water Street. I.A. Beals Shoe Company of Brockton accepted the attractive offer to transfer their operation to Holliston on December. Fifty families were expected to make the move also, along with many single workers who would be in need of housing, which was seen as an opportunity for parties with rooms to let. Manufacturing began in earnest and with optimism, and many previously idle shoe shop workers of Holliston found gainful employment once again. I.A. Beals encountered some unanticipated problems, conducting business in Holliston incurred higher costs than elsewhere, so Beals and company returned to Brockton after 18 months, long before a reasonable return had been seen by the investors. 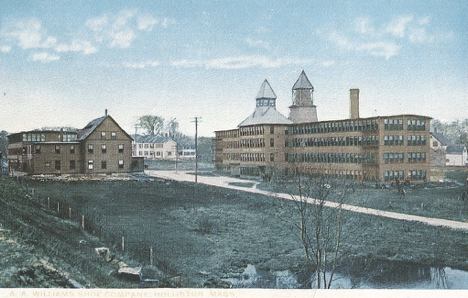 Tenants were housed at the Big Shop from time to time during the remainder of the 1890s, but the building was vacant in 1898 until Arthur A. Williams, after a fire at his factory in Cochituate, made the move to the spacious factory building on Water Street – encouraged to look at the Holliston site by John Clancy, Holliston’s most prominent manufacturer of shoes. Realizing he was nearing the end of his work, Clancy wanted to bequeath the shoe workers of Holliston to a worthy manufacturer. Williams expanded the facility with an additional building on the west side of the street and connected the two buildings with a much admired tunnel (built to avoid the unpleasant aspects of weather and rumored to keep new products under wraps). The Goodwill Shoe Company provided steady employment in a stable economic environment, Williams had one of the longest and most successful business records in Holliston history and became Holliston’s first “moneyed man” of the twentieth century.